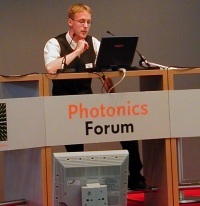 1) U. Brinkmann, "A Laser-Based Three-Dimensional Display", Lasers & Applications, Vol. 2, No. 3, 1983. 2) B. G. Blundell, A. J. Schwarz, D. K. Horrell, "The Cathode Ray Sphere: A Prototype Volumetric Display System", Proceedings of Eurodisplay '93, pp. 593-596, Strasbourg, 1993. 3) M. Lasher, P. Soltan et. al., "Laser Projected 3-D Volumetric Displays", Projection Displays II, Proceedings of SPIE Vol. 2650, pp. 285-295, San Jose, CA, 1996. 4) D. Bahr, K. Langhans, D. Bezecny, D. Homann, C. Vogt, "FELIX: A volumetric 3D imaging technique", New Image Processing Techniques and Applications: Algorithms, Methods, and Components II, Proceedings of SPIE Vol. 3101, pp. 202-210, München, 1997. 7) K. Langhans, D. Bezecny, D. Homann, D. Bahr, C. Vogt, C. Blohm, K.-H. Scharschmidt, "New portable FELIX 3D display", Projection Displays IV, Proceedings of SPIE, Volume 3296, San Jose, CA,1998. 8) K. Langhans, "FELIX 3D Display", Siggraph Conference Abstracts and Applications, Computer Graphics Annual Conference Series, 1999. 9) K. Langhans, D. Bezecny, D. Homann, D. Bahr, K. Oltmann, K. Oltmann, C. Guill, E. Rieper, G. Ardey, "FELIX 3D Display: An Interactive Tool for Volumetric Imaging", Stereoscopic Displays and Virtual Reality Systems IX, Proceedings of SPIE, Volume 4660, San Jose, CA,2002. 10) K. Langhans, C. Guill, E. Rieper, K. Oltmann, D. Bahr, "SOLID FELIX: A Static Volume 3D-Laser Display", Stereoscopic Displays and Applications XIV, Proceedings of SPIE, Volume 5006, Santa Clara, CA,2003. 11) K.Langhans, K. Oltmann, S. Reil, L. Goldberg, H. Hatecke, FELIX 3D Display: "Human-Machine Interface for Interactive real Three-Dimensional Imaging" ,Virtual Storytelling,Strasbourg, France 2005. 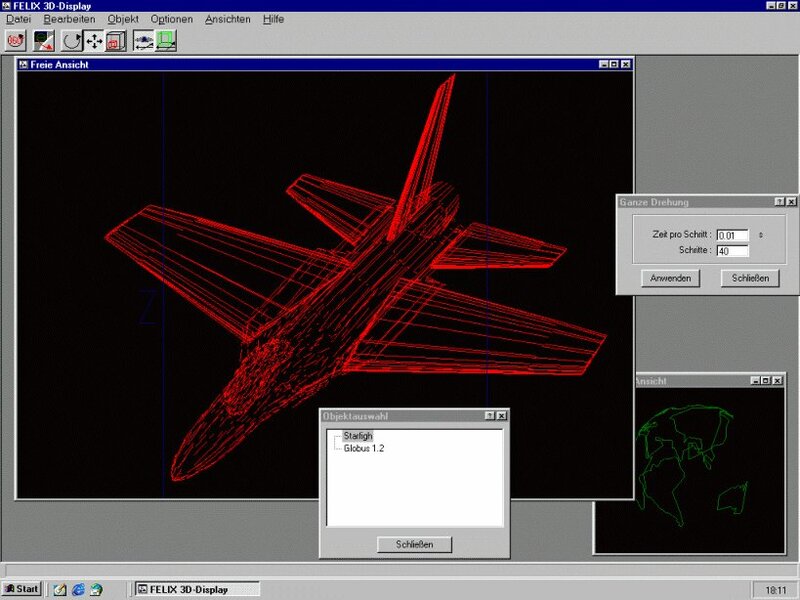 2) H. Lemme, "3D-Bilder aus der Glasglocke", Elektronik 22/1996.